Photo by Dave Wtihrow, NOAA Fisheries. 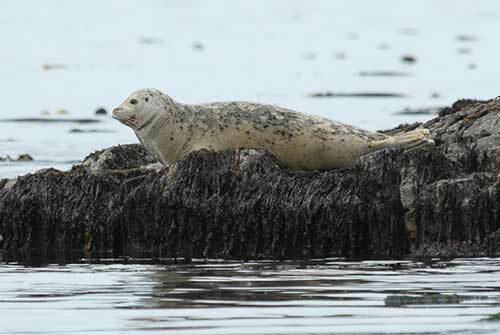 Overall the harbor seal population in Alaskan waters is fairly healthy. But there are some places like the western Aleutian Islands, where harbor seal populations have declined and scientists still don’t know why. During the 1980s and 1990s, the number of harbor seals, Steller sea lions, and sea otters declined dramatically throughout the Aleutian Islands. These declines were especially severe in the west, where harbor seal counts declined by 86 percent. Numbers appear to have stabilized at low levels now, but so far none of these populations are showing adequate signs of recovery. Despite the remoteness of this location, scientists are studying sea lions there, but harbor seals are a bit more challenging. Because Steller sea lions eat Atka mackerel, a popular fish caught in commercial fisheries, there is interest and funds to study them. But, harbor seals’ diet in the Aleutians hasn’t been studied and they are not viewed as a competitor nor an economic threat to fisheries. There is another reason why studying them is challenging. “In the Aleutians, harbor seals are difficult to find and harder to catch. They tend to haul-out on low-lying rocky areas surrounded by kelp, often alone or in small numbers unlike sea lions which form rookeries,” said Shawn Dahle, biologist, Alaska Fisheries Science Center, NOAA Fisheries. This year Dahle with a team of NOAA Fisheries scientists collaborated with veterinarian, Dr. Claire Simeone, from The Marine Mammal Center of Sausalito, California, and Ron Snigaroff, a member of the Aleut village of Atka and local expert, to learn more. 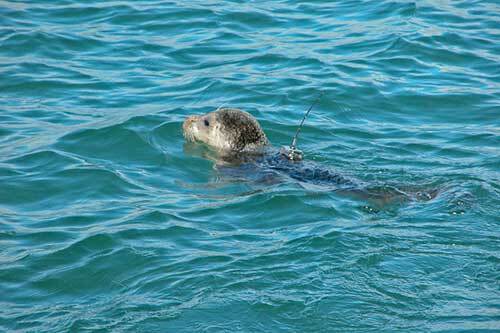 They launched a large-scale satellite tagging effort to monitor movements and behaviors of harbor seals. The research team caught, sampled, and released 31 seals of various ages at six different locations between Unalaska and Atka Islands. The seals were examined, measured, and weighed to assess their physical condition. Blood and tissue samples were collected to analyze their health, physiology, diet, and genetic composition. Photo by Josh London, NOAA Fisheries. Scientists also attached two types of satellite tags to track animals. Scientists glued satellite tags to hair on the heads or backs of 27 seals that had sufficiently completed their annual “molt” (shedding and regrowth of hair and skin). These tags will transmit the seals’ movement, dive, and haul-out behaviors for up to 1 year and then will fall off during next year’s molt. Where they could, scientists also attached a second smaller satellite tag to the hind flippers of some animals to gather information over a longer timeframe. These tags will remain attached throughout the molt cycle, perhaps for several years, and continue to transmit location and haul-out data during this important time of year. Scientists conducted a similar project during September 2014 in Clam Lagoon, Adak Island, Alaska, sampling and tagging 15 harbor seals. They are planning another research cruise covering the central and western Aleutian Islands for September 2016. When combined, data collected over these three years will generate a more complete picture in space and time of harbor seal abundance and behavior in the Aleutian Islands. Overlapping with this tagging study was NOAA’s annual statewide aerial survey. NOAA Fisheries and NOAA’s Office of Marine Aviation and Operations work together to photograph harbor seals from a plane. These photos are then taken back to the laboratory an analyzed to complete an accurate seal count. “During the aerial surveys we’re only able to see the seals that are on land. We don’t know how many are actually in the water. So, we have to use statistics to help us estimate population size,” said Peter Boveng, Polar Ecosystems Program Leader, Alaska Fisheries Science Center, NOAA Fisheries. “Satellite tags help us fill in the gaps. They tell us more about how much time animals actually spend on land vs. in the water. With this information we can improve the accuracy of our population estimates,” he said.